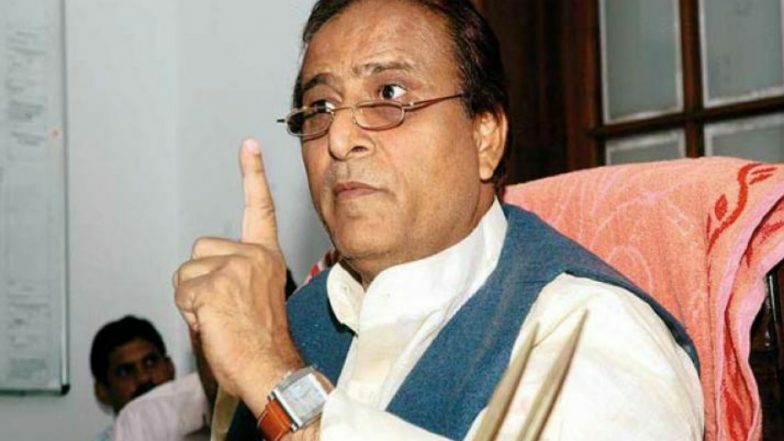 Rampur, April 15: Samajwadi Party candidate from Rampur Lok Sabha seat, Azam Khan, on Monday clarified that he did not make 'khaki underwear' comment against his Bharatiya Janata Party (BJP) opponent Jaya Prada. Asserting that he did not name anyone, Azam Khan said that he would not contest the Lok Sabha election if proven guilty. A political controversy erupted after Khan's below-the-belt remark against Jaya Prada. An FIR was also registered against him for the controversial remarks. "I have said that people took time to know real face in reference to a man once said that he brought 150 rifles with him and if he sees Azam, he would have shot him dead. My leaders also did a mistake. Now, it has been revealed that he has an RSS pant on his body. Short is worn by men," Khan told ANI. "If anyone proves that I have named anyone and insulted anyone by name, I will withdraw my candidature from the ongoing polls," the SP leader added. Rampur Lok Sabha Constituency in Uttar Pradesh: Candidates, Current MP, Polling Date and Election Results 2019. Khan also accused the media of misinterpreting his comments. "I am disappointed. Media did not like me; I also did not like them. They have caused damage to the country," he said. Addressing an election rally in Rampur on Sunday, Khan, without naming Prada, made the objectionable remarks. The SP leader said it took him just 17 days to understand that she wears 'khaki underwear'. "You got represented (by her) for 10 years. People of Rampur, people of Uttar Pradesh and people of India, it took you 17 years to understand her reality. But, I could recognize it in 17 days that she wears khaki underwear," Khan had said. National Commission for Women termed his remarks 'extremely disgraceful' and said the panel will be sending a show cause notice to him.